*Important Installation Notes: Please check that the CD MP3 Changer function is activated on your factory stereo. If it is not activated - you will need to contact dealer and ask to activate the CD changer function. Factory CD will have to be disabled to use GROM-MST4. 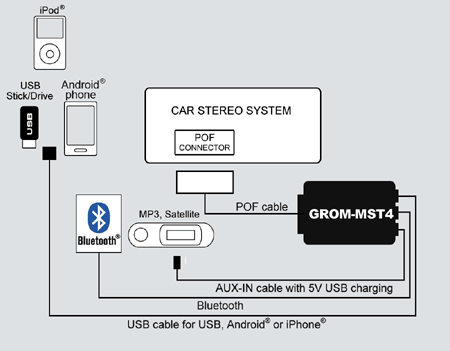 USB Connection: GROM-MST4 car stereo adapter connects your USB 2.0 device such as flash drive, external hard drive or mass storage device to the stock stereo in your car. You can control the playback through your car stereo or steering wheel controls. Folder, playlists browsing is supported for iDrive BMW stereos. - AUX 3.5mm phone jack cable for any MP3 player, mobile phone, XM, etc.